This afternoon I returned to PilotEdge for a second flight, with the good and not-as-good of last night under my belt as experience. Taking the advice of the PE forums seriously, I spent some time in the PE pilot resource center, and watching most of the general VFR workshop in particular (and now I’m a much better reader of VFR charts in particular … who would have thought that all that magenta-bordered class E airspace was so run of the mill?). My plan was to practice touch-and-gos, in a tower-controlled pattern, but far away from the more crowded airspace of Los Angeles. 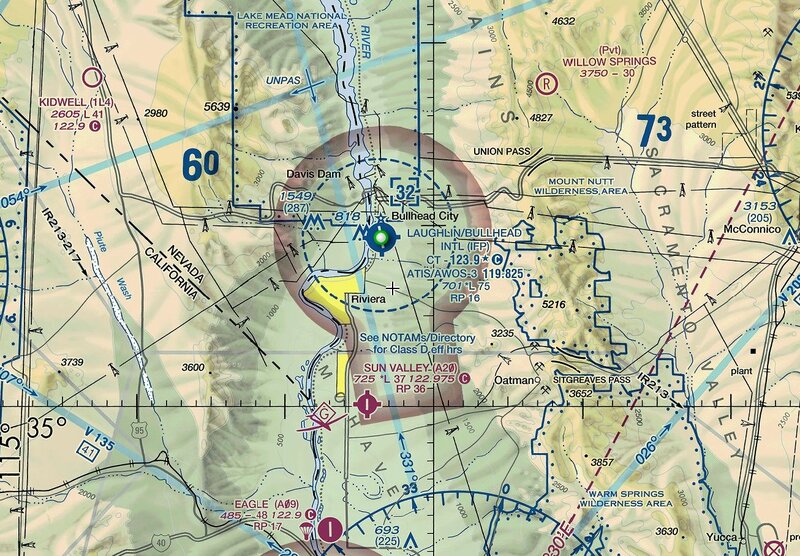 Looking at the PE coverage map I settled on Laughlin/Bullhead airport in Laughlin, NV (KIFP). Class D (which is what that dashed-blue circle means), controlled, but very quiet. A good place to get familiar with the calls and process before going for a V-01 rating on PE. Everything went great. I was much less nervous that last night, started up the SimCessna, got a radio check and weather, then got taxi clearance and departure clearance from the PE controller. Made my crosswind, downwind, and base turns, and was cleared for final. About then I noticed that the Saitek information panels in the sim had crashed (unusual … I dallied with a SPAD.neXt driver install last night and think things are still tweaked). This meant I had no airspeed or engine data. I realized this just as I was on short final, maybe a mile out. “What would happen in the real world?” I thought. “You’d call off the touch-and-go and ask for a full stop landing,” I replied to myself. So that’s what I did: I called KIFP tower (and this was on very short final), said airspeed was inop, and asked for a full stop. “No problem,” he said. I landed, taxied off, and got direction to taxi to the ramp on the frequency. I did so, then let the controller know that I was going to disconnect to solve the sim issue. “No problem,” he said. It was all very cool. Very real (for not being real). I’m definitely hooked on PilotEdge. It absolutely adds an entirely new and significantly richer texture to the sim experience. And using it means learning, which is always good. I’m all in on PE.